From the time we are conceived, the power of touch is central in our lives. From our mother’s womb, to her first embrace, through all the cuts and scrapes of life, when family, friends, spouse and others “touch us”: — sometimes physically, sometimes emotionally, the human condition is nourished by touch. Why? For the obvious reason. We all need to feel worthy. We all need to be “loved” in one fashion or another. We all want to believe that we do mean something to someone or, depending on the size of one’s egos, to a whole group of people. Regardless of our stature in life, or the size of our bank account, or the titles we bear, it is a comfort to know someone cares. And touch is a means of communicating that. We shake hands, or we hug, or we embrace, or we pat each other on the back, or we “touch” over the miles, through cards, and emails, and Skypes and Facebook etc., they are all a means of reaching out and touching. Today’s Gospel is a powerful demonstration of that but it is also far more than that. Because in its symbolism, it sends a profound message about what it means to be a follower of Christ. But let’s start with the basics. We know from hearing this Gospel before, that the person with leprosy was an outcast – literally cast out from society because he or she was not only unclean and diseased but capable, in the belief of that day, of contaminating others. So the lepers lived a life that was outside of life – outside the life of their family, outside the life of their village, outside the life of their synagogue, certainly outside the life of the Pharisees – they lived a life that was untouched by the human spirit, by human compassion, by human friendliness and they were, by all means, untouched. But you know that. So Jesus decides to challenge that ostracism. But more importantly, he decides to teach us a lesson about ostracism in general. In Jesus’ view, the “leper’s” problem is not polluting, so with one touch he restores the leper to full membership in God’s community, to solidarity in human fellowship. With that restored, what was the message? The message is that the human condition creates lepers every day. The neighbor next door is really someone we don’t care for, so we shut them out. The person down the street doesn’t have what we have so that person really is not up to our standard, our way live. Some people in our community don’t share our political views, so we shunt them. Or, dare I mention, those whose persuasions are different from ours, man, they have to be shut off, after all, if we go near them, we might get what they are. Do you see what is behind this? Jesus doesn’t just address individual needs, but condemns practices that cause people’s misery. That’s why he touched the untouchable. That’s why he was so moved by the leper’s condition. Jesus challenges his culture’s judgment. In Jesus’ view, the “leper’s” problem is not pollution. With his touch he restores the leper to full membership in God’s community, to solidarity in human fellowship. And by doing so, what is the lesson he is sending forth? He is challenging us that we too must work to take down walls that separate people according to religious, social, economic, racial, gender, etc. differences. The leper’s pain wasn’t just physical, but included the misery of being counted as unworthy of the secular and religious life of the community. He would also have thought that he was unloved by God. In the thinking of his day he would have thought that his illness was a punishment from God for some sin or ritual violation he had done. Not only would he experience expulsion from human society, but would feel as an outcast before God. How desolate was that! – to be suffering so much and feel that not even God was there for support? A woman told me recently that after her divorce she was cut off from old friends, from some Church friends, even some family members and her parish. “I felt like a leper!” And what about the handicapped, gays, elderly, women, the indigenous, the very poor or even the poorer Latinos? Do we even stop to reflect on their condition? Do we ever wonder if they are cut off from the parish, their families, their neighbors and the community? 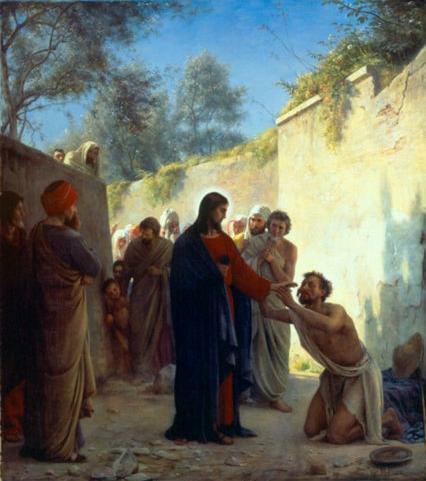 Remember, the man Jesus healed was outside the community. That’s how the above-mentioned often feel – cast off and forgotten. You know, some of us might say we “feel bad” for someone. According to what Jesus did that isn’t enough. We need to get in touch with our deep feelings of compassion and then do something for those who move us. And still more – we need to go beyond the usual boundaries our church and society observe. By curing the excommunicated leper, Jesus tells us where we Christians should be found – “outside the pale” – beyond traditional boundaries. Why? Because that’s where we will find Jesus and his community of the healed and saved. Think about the Sermon on the Mount. Better yet, read it again. Jesus is founding a new community, which includes those he called to be his followers; but also the outcasts, widows, orphans, the poor and the impure. There is no exclusion in his community, contrary to the religious atmosphere of Jesus’ time and, it must be said, of our own as well. God’s kindness has broken into our world and changed our ways of judging. God’s kindness has broken into our world and changes the way we judge others and is reconstituting the human family. As we get ready for the Lenten season, do you want to do something really different? Go and reach out to a person or persons you have avoided for a variety of reasons, see them first as a child of God, get to know them, let your kindness and your spirit :”touch” them, let them know that because you are both brother and sister, that no difference should separate you. Acknowledge their worthiness in the community of humanity AND IN YOIUR EYES. If Pope Francis can utter the words: “Who am I to judge” then how dare any one of us?